CHOC Children’s Laboratory Services is one of the only dedicated pediatric labs in Southern California. Conveniently located on the lower level of the Bill Holmes Tower, right off the elevator, the 20,000 square foot lab is dedicated to offering the most compassionate blood draw experience possible while providing physicians with quick, accurate results and around-the-clock service for our inpatients and children visiting our Emergency Department. At CHOC Children’s, we specialize in providing children with the most pleasant experience possible—even when it comes to having blood drawn. All of our phlebotomists (people specially trained to draw blood) have at least two years of experience working with children before coming to CHOC and receive very special training upon being hired to work with our patients. Our associates have a one visit, one poke goal for each and every patient they see. Whether they are drawing blood on a teenager or a wiggly toddler, they work with each patient and the patient’s family to try to only have to insert the needle one time. At CHOC Children’s, we pride ourselves on processing blood, urine and stool tests as quickly and efficiently as possible using the very latest equipment and expert staff. Physicians connected to our computer network are often able to get routine results within 60 minutes. A blood test helps doctors understand the elements in a patient’s blood. Depending on why a doctor recommended a blood test, he or she might be looking for only one factor in the blood or several. A doctor might order a blood test to find out if a patient is sick, if the body is responding to an allergy or if a patient is at risk for certain health conditions. Regular blood tests might be ordered to keep track of how well a condition such as diabetes or high cholesterol is being managed. It is every patient and caregiver’s right to know why a certain test has been ordered, so never hesitate to ask the doctor or staff about the reason for a test. Blood tests can provide a lot of information about whether certain elements in the blood fall within a normal range, but in many instances they are only part of the information a doctor needs to make a diagnosis of a medical condition. What should be brought to the blood test? The child’s caregiver must bring the doctor’s order for the blood test to the main reception area in the CHOC Children’s lobby upon arriving at the hospital. A favorite stuffed animal, doll or blanket can be very soothing before, during and after the blood draw for children—not just babies and toddlers. Pacifier, if the child uses one. Bottle, sippy cup, water bottle or juice box to drink for before and after the procedure. Children who have been asked to fast may drink AFTER the blood draw only. Toys with buttons and/or lights may be a useful distraction for toddlers and preschoolers. Small toys like cars, dolls and action figures can be useful distractions for some school-aged children. An MP3 player with favorite music may be helpful for older children. How should patients prepare for a blood test? Many blood tests don't require that anything special be done before the blood draw. These types of tests are used to see what a patient’s blood is like under normal conditions. For others, however, patients may have to fast for a certain amount of time before the blood test. That usually means no eating or drinking anything after midnight on the night before the test. The child’s doctor will provide fasting instructions if they are necessary. Are there any tips for patients who must fast? CHOC Children’s Laboratory Services is open Monday through Friday at 8 a.m. Patients may check in at the main lobby before 8 a.m. so that they may have the blood drawn shortly after the lab opens. Because patients who have been asked to fast may only eat up until midnight and cannot eat breakfast before their blood test, we recommend a hardy dinner and even a light snack before bed so that the child is not too hungry in the morning. How can children be prepared for a blood test? The idea of an adult sticking a needle to take blood can be very scary for children of any age. At CHOC, our phlebotomists are specially trained to work with children to not only minimize the pain of blood draws but calm the child’s anxiety about the test. Provide only the truth, as honest explanations about the test are best. If possible, choose a quiet time to discuss the test. This is not always easy because tests are often performed hours or even just minutes after a doctor’s appointment. Always use a calm, reassuring voice. Caregivers must choose their words carefully to prevent misunderstanding and extra stress. What happens when blood is drawn? In order to test a patient’s blood, a technician called a phlebotomist will use a needle to take a sample of blood. In most cases, the blood is taken from a vein in the patient’s arm. The child will be seated in one of our private blood draw rooms for the procedure. Usually the child will be asked to make a fist and the technician will use a band to constrict the child’s arm. Once he or she finds a usable vein, the technician will clean the area and then insert the needle. The child might feel a small pricking sensation. Once the technician has drawn enough blood, he or she will take the needle out and put an adhesive bandage over the site. The child or the child’s caregiver may be asked to press firmly on the site to stop any bleeding. What happens after blood is drawn? 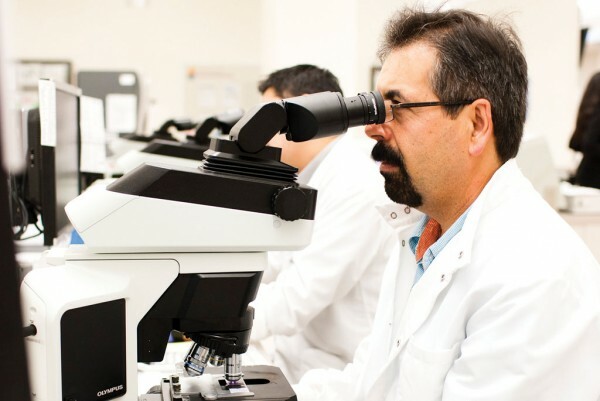 After blood is drawn, the blood sample is taken just steps away to our state-of-the-art lab where trained laboratory scientists look for the information the doctor has ordered. Our skilled scientists, advanced technology and fast reporting systems make it possible for doctors to get some test results within 60 minutes. Other more advanced tests can take up to several days. The child’s doctor will discuss the results of all blood tests as soon as they become available. We are located on the lower level of the CHOC Children’s Bill Holmes Tower, just outside the elevators. After parking in the structure next to the hospital, patients must check in at the main reception area in the lobby of the hospital with the lab request from the child’s physician. Get printable maps of our campus in English or Spanish.